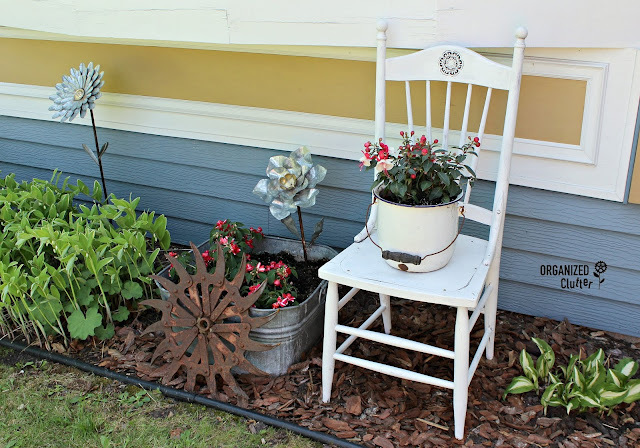 This is a junk garden photo from 2012 featuring my favorite old garden chair. Part of the charm of this vignette can be attributed to the vintage Perfection heater, but I do love the chair too. The chair is from my mom's house. 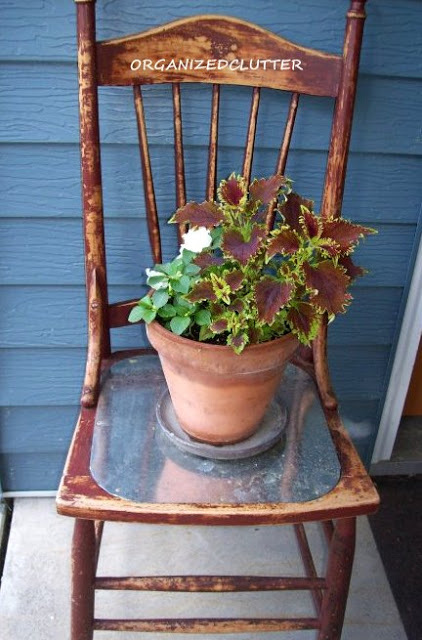 It was painted a dark reddish burgundy, and had a caned seat. She had distressed the chair with sandpaper. I replaced the caned seat with a piece of galvanized sheet metal. It was just screwed on from the top, junky style. 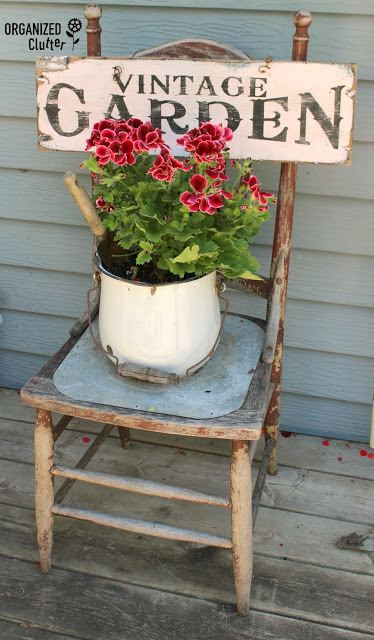 The chair appeared somewhere in my junk garden decor every year. Eventually, most of the paint was gone. The chair needed a new look. It was time for a chair makeover. 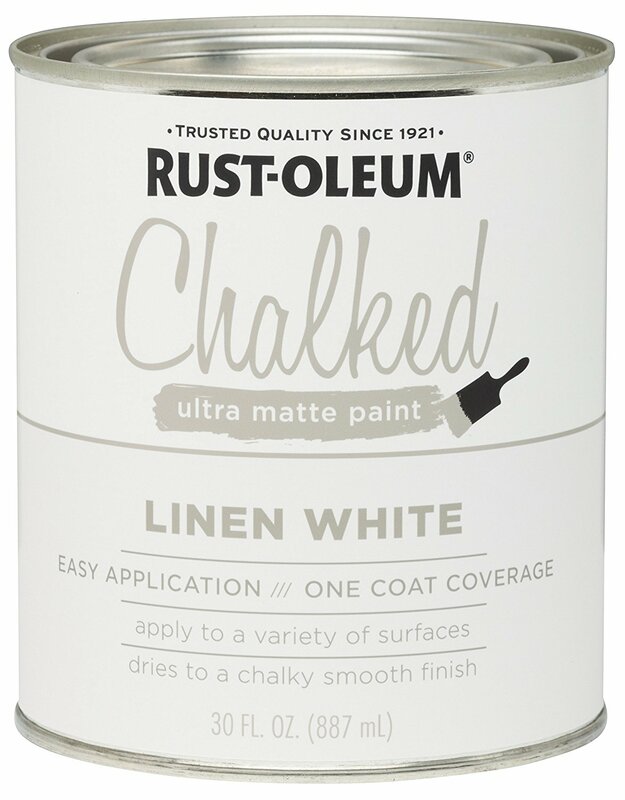 First, I watered down some Rust-Oleum Chalked Paint in Linen White about 1/2 water, 1/2 paint. 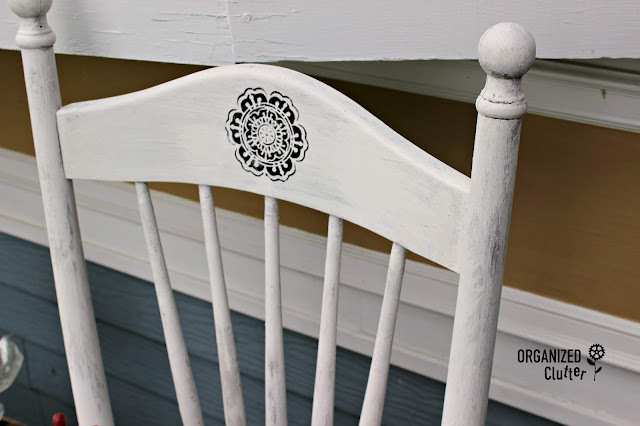 I did a whitewashing technique with the watered down paint that covered the chair somewhat opaquely in some areas, and heavier in areas, rather than 100% paint coverage. 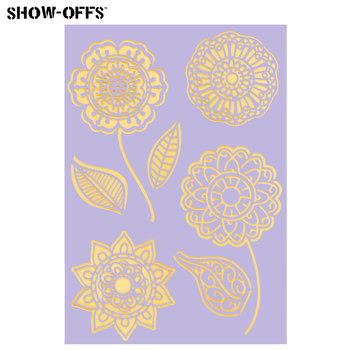 I then stenciled on a Boho flower from a Hobby Lobby stencil with Ceramcoat black craft paint. 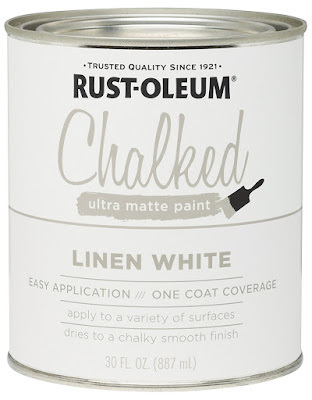 I sealed the Chalked Paint and stencil with two coats of Helmsman Spar Urethane Aerosol in Satin . I like the fresh clean look of the white paint. I like filling in around my garden pots and plants with pine bark chips. I planted my laundry tub with three Silhouette Rose Star double impatiens. 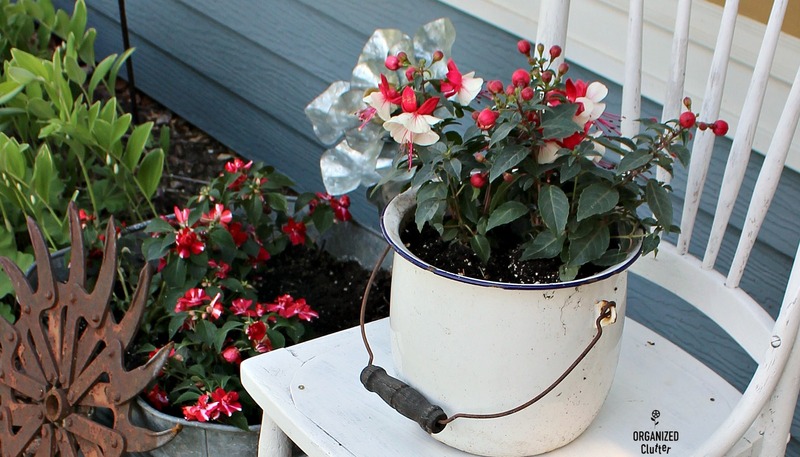 The enamelware pot is planted with three Arroyo Grande Upright Fuchsias. This is a shady area with a northern exposure, so impatiens and fuchsias work well. My Variegated Solomon's Seal perennial is at the left of this shady spot. 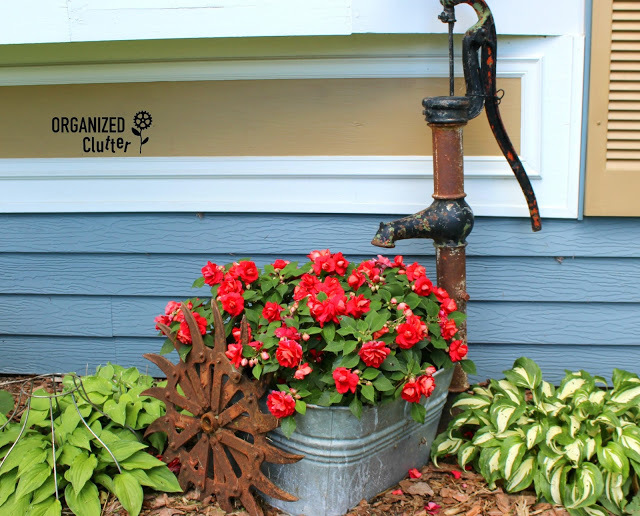 The rusty thing in front of the laundry tub is a rotary hoe cultivator wheel. 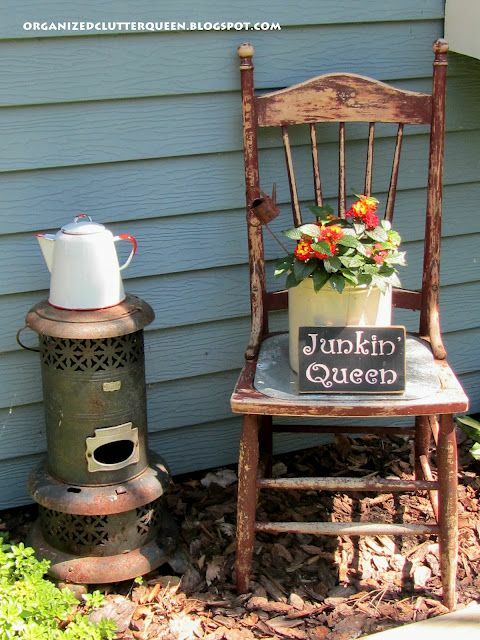 I have two now, and I love them for the junk garden. Unfortunately, my three galvanized flowers from Kalalou are out of stock at Amazon, but you may be able to find them elsewhere. 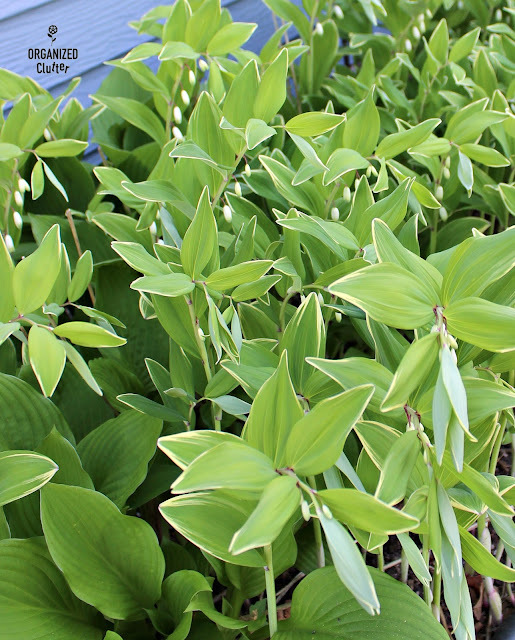 This is a close up of Variegated Polygonatum 'Variegatum or Solomon's Seal , almost in bloom. I started these plants with 3 bare roots several years ago. 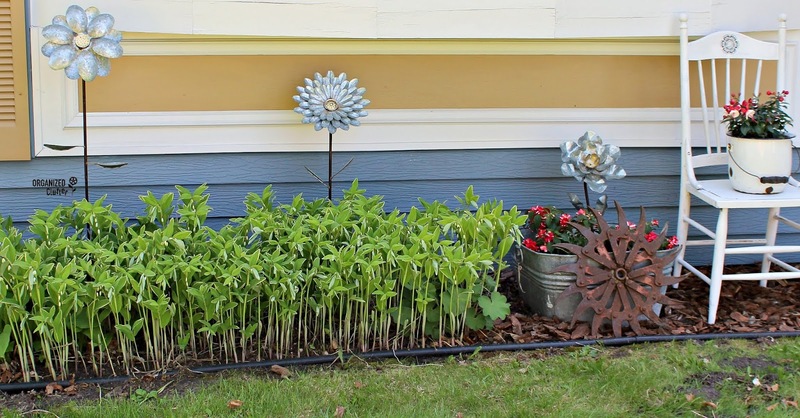 To the very far right is my hay rake, with ends welded together to form a flower. I spray painted it white. Here I had a terracotta color bike to match my accent color at that time. 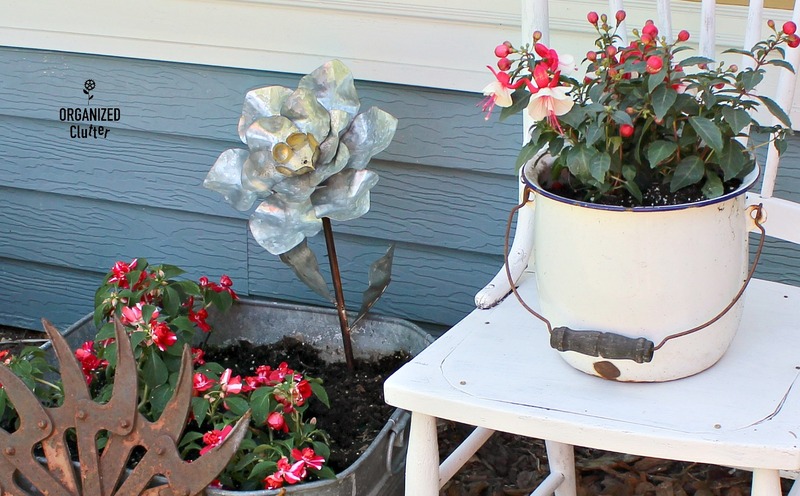 It was planted with a fuchsia, impatiens, and sweat potato vine. This shady spot is perfect for double impatiens. They just thrive here. Hostas, Solomon's Seal and Lady's Mantle across the front of the house. The old pump was in my mom's garden years ago when I was a kid! 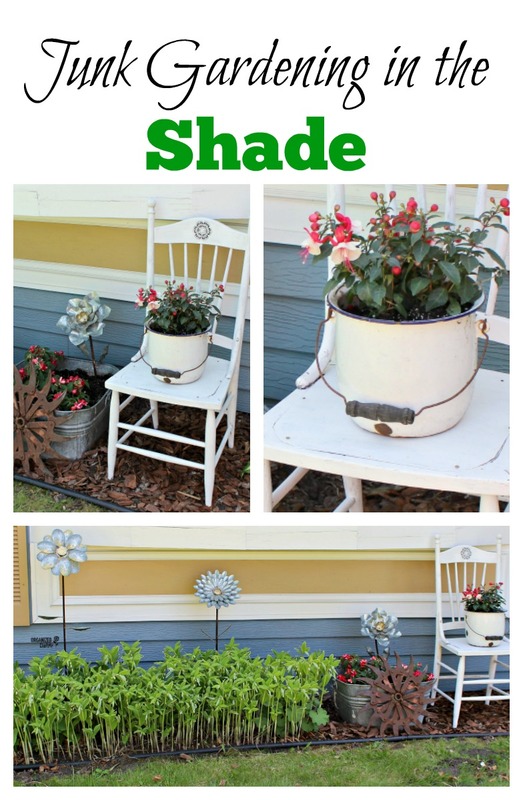 I hope you are enjoying my garden planting ideas! Postively gorgeous Carlene! Love the vignettes and such a wonderful variety of blooms as well! Beautiful Carlene. Our wild deer would have a feast in your yard. Love all your old accent pieces too. So special. I know you work hard to keep it looking so good. Just found your site and love all that you are doing. 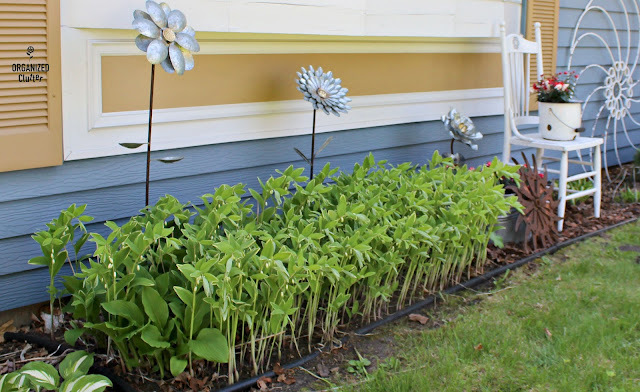 I have tons of junk in my garden and in my house and you have given me so many ideas. Love the new chair makeover. I love chairs in the garden. 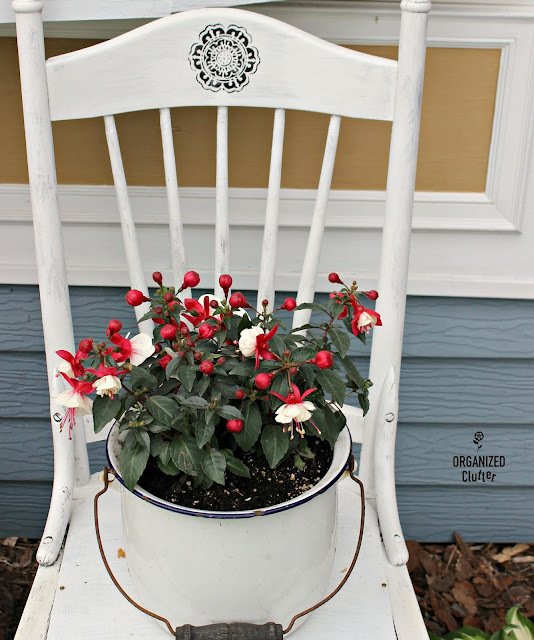 My old chair got a paint makeover this year too. I can't wait to display it. Happy gardening!